Rajasthan, earlier called Rajputana obtained statehood when it was merged with the Dominion of India in 30th March 1949. It covers an area of 342,239 sq kilometers and is 10.4% of India’s total area. It is located on the northern side of the country, where it comprises most of the Thar Desert. All the things that come to mind when you think of India can be found in Rajasthan -palaces, forts, desert, camels, elephants, and snake charmers. In this post read about a list of the top 10 places to visit in Rajasthan. There are innumerable tourist places to visit in Rajasthan. Each and every place, extremely unique with an enthralling story behind it. Rajasthan’s strong adherence to tradition is precisely what makes it a compelling place to travel around. 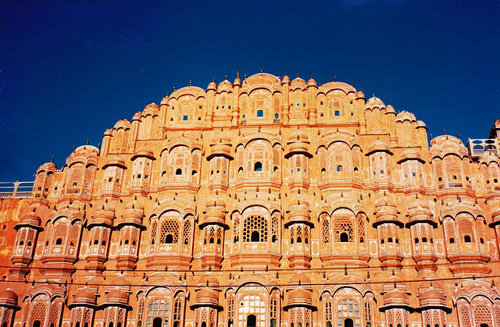 Jaipur is popularly known as "Pink City" and is the capital city of Indian state of Rajasthan. It was founded 'Maharaja Sawai Jai Singh II' in the 18th Century and city was named after him. It is one of the top places to visit in Rajasthan. It’s the 10th most populous city in India. Jaipur is a nexus of heritage, modernity and sheer beauty. It holds cultural heritage sites like the fort of Amer and Hawa Mahal. Jaipur is a part of India’s golden triangle tourist circuit. A visit to Jaipur will give you a feel for how the monarchy once lived in all its glory. 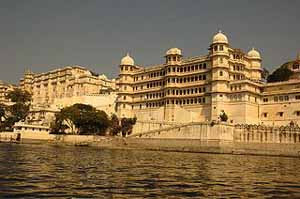 It is the historic capital of the kingdom of Mewar. Udaipur is a dazzling city full of ancient manors, intricately designed temples, and grand mansions overlooking exquisite lakes. The City Palace, which stretches along the eastern shore of Lake Pichola, is a highlight. Other amazing places to visit in Udaipur are The Lake Palace located near Jag Niwas Island, The Monsoon Palace which was the summer getaway for the royalty in the erstwhile era and also The Jagdish Temple. Also known as the Golden City of Rajasthan. The city is best known for its beautiful sand dunes, its impressive fort and the exotic culture and traditions of the people. Jaisalmer looks like the city where all of the Allahdin cartoon series was shot. It looks as if it has risen straight from the sand dunes and a must visit place in Rajasthan. A must visit places in Jaisalmer are The Jaisalmer Fort, locally called Sonar Quila, Sam sand dunes s a place where one must go to experience the vastness of the Thar Desert. Gadsisar lake and and The Desert National Park are the other major tourist spots. Informally known as the "Blue City" for its blue painted buildings, Jodhpur is a must visit place in Rajasthan. Mehrangarh Fort stands tall over the old part of the city giving it an exquisite and royal look. It is one of the largest forts in India standing 400 ft above the ground. Every October it has the honor of providing the setting for the Rajasthan International Folk Festival. Other places to visit are the serene lakes of Balsamand and Kailana. Both of the lakes are surrounded by beautiful lush green lands and are a must visit for bird lovers. Before the 15th century, Bikaner was called Jangladesh and was all barren wildernesses and now it’s popular for its food and forts. 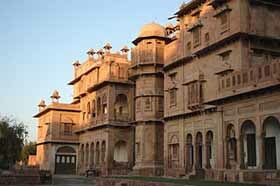 It is the home of the Junagarh Fort, all of which has been preserved to show the grandiosity with which Maharanas lived. The very famous Karni Mata Temple is also located in Bikaner. The various arts and crafts of this place are also unique, especially the intricately carved windowpanes called jharokhas. If one wants to taste authentic Rajasthani Cuisine, Bikaner is the place to go and explore. It lies in the Ajmer district of Rajasthan and is described as the most important of all the pilgrim places. Pushkar lies beside the famous Puskar lake which has been said to form out of Lord Shiva’s tears. The town is one of the oldest cities of India and the date of its origin is unknown and is often associated with the Hindu mythology. One of the most prominent attractions in Pushkar is the annual camel festival. It’s a week long affair where exchange of livestock is done. But that’s not it, the entire week is filled with music, creative arts performances and multiple other events. 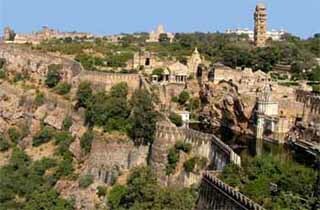 Chittorgarh also called Chittor was founded by the Mauryan Dynasty. It has had a major role in defining history, a lot of prominent historical figues like the The Great Maharana Pratap and the saint Meera Bai, both were born here. One of the major places here is the Chittorgarh fort, which is the largest fort in India. 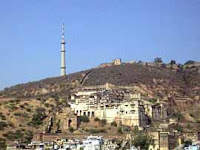 The fort was the former capital of Mewar before its relocation to the more secure city of Udaipur. The fort was founded in the 7th century by the 1st Sisodiya Rajput Ruler Bappa Rawal and spreads over an area of 2.8 sq kilometers and its highest elevation point is 1,075 meters above sea level. The Chittorgarh fort exemplifies the best of Raiput Architecture. If you're an art lover, or even someone who's into architecture and history, the Shekhawati region of Rajasthan is well worth including on your itinerary. It’s located in the Northern Region and is on list of tourist places to visit in Rajasthan. History has it that during the 18th and 19th century, the Marwari merchants in a quest to outdo each other in display of affluence and wealth constructed beautifully intricate and expensive havelis. Therefore, this unique region is often referred to as the world's largest open air art gallery. To see- Mandwa Fort, The Vivanaa Culture Hotel and the Dundlod Fort. It is located in the Hadoti region of Rajasthan and isn’t a very known place in terms of the traffic of tourists it gets. It’s a place of rich heritage, ornate forts and palaces and step well reservoirs known as Baoris. The Targargh Fort or the Star fort is a marvel of architecture from Medieval India. The reservoir was constructed with three tanks, which at no point during the year goes dry. The technique was precise and well calculated that the baori still stands and fulfills its purpose. It is also known as Lohagarh it has now been included in the National Capital Region (NCR). The city is also considered to be the Eastern Gateway to Rajasthan. Deeg Palace is one of the most important tourist attraction in which was constructed by Badan Singh, what started off as a summer resort for the royalty was also briefly the capital of the Jat kings before they shifted To Bharatpur. Deeg witnessed the legendary battle between the Jats and the Mughals and Marathas combined. 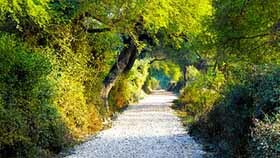 Another major tourist spot is the The Keoladeo National Park which was formerly known as the Bharatpur Bird Sanctuary. The park plays host to a large number of migratory birds during the winters. An estimated number of 230 species of birds have made the Keoladeo National Park their home. It is a popular hill station in the Aravalli Range in Sirohi district of Rajasthan state. It is referred to as 'an oasis in the desert' as its heights are home to rivers, lakes, waterfalls and evergreen forests. It is a city in the Rajsamand District of Rajasthan located 102 km west of Udaipur and is an interesting destination, which attracts tourists for its massive citadel built 1443 A.D. and the wildlife sanctuary nearby. An important historic city of Rajasthan. Kota is famous for its architectural heritage comprising of beautiful palaces, temples, museums, all reflecting the splendor of the bygone era. The major tourist attractions in Kota Tour include the City Fort and Palace, Rao Madho Singh Museum, Jagmandir Palace, Haveli of Deaji and Chambal Gardens among many more. Best Time To Visit : September To March. A village located in Desuri tehsil near Sadri town in the Pali district of Rajasthan in western India. 162 km from Jodhpur and 91 km from Udaipur. Ranakpur is widely known for its marble Jain temple, said to be the most spectacular of the Jain temples. Hanumangarh is a city in northern Rajasthan state in western India, situated on the banks of the river Ghaggar also identified as Ancient Sarasvati river, located about 400 km from Delhi. Major tourist attarctions of Hanumangarh, Rajasthan are Bhatner Fort, Temple of Mata Bhadrakali , KaliBanga and Historic Gurudwara. It is a town in the desert region of Rajasthan state of India. It lies in the Thar Desert. It is famous for the shifting sand dunes of the Thar Desert and beautiful grand havelis with marvelous fresco paintings, namely Kanhaiya lal Bagla ki Haweli and Surana Haweli, with hundreds of small windows. Sixty-five kms from Udaipur, it is arguably the most beautiful lake in Rajasthan. Major Tourist Attraction -Rajsamand Lake. Best Time To Visit -October to March. A town in the state of Rajasthan located a 180 km away from Jaipur, 220 km from Bikaner and 240 km from Delhi. The town is famous for the frescos on its grand Havelis; a special artistic feature of this region. The beautiful city in the state of Rajasthan, is famous for its culture, clothing, tranquility and prehistoric architectural wonders. Places to see -Harni Mahadev, Mejha Dam, Menal, Joganiya Mata, Triveni, Mandalgarh Fort and Shahpura. It is 55 km from Jaipur, 100 km from Hindaun City, 240 km from Delhi and situated at NH-11. It is also known as "Dev Nagari". Major attractions-Abhaneri and Mehandipur Balaji Temple . It is 240-km From Jodhpur, Rajasthan. Places to visit in the city are Jalore Fort, Kirti Stambh and Nadishwar Deep Tirth, Jalore Wildlife Sanctuary and Fort Gateway. Best time to visit-October To March. Climate- Extreme cold in winter and hot in summer.. The beautiful small town, known for its forts and havelis. Best time to visit -October to March. It is located at a distance of 113 km from Bharatpur. Places to visit in the city are Ramsagar Sanctuary, National Chambal Wildlife Sanctuary, Shree Ramchand and Hanuman Temple and Van Vihar Wildlife Sanctuary. An ancient town located in the Jodhpur District of Rajasthan state in western India and is famous for its Hindu and Jain temples. The native place of the Bhil tribe, Banswara is also called as "City of Hundred Islands". It is about 160 km away from the lake city of Udaipur. A small village located in the district of Pali, Rajasthan, is famous for its heritage, landscape and wildlife. Best time to visit-October to March. You can help in editing this post. Please share your thoughts/changes (if required) through comment. We will give you proper credit. There are so many popular places to visit in Rajasthan. The Great Forts, Palaces, Lakes, Adventure thriving Forests, Sunny Weather, Sand Dunes, Camels and Multicolored Turbans make Rajasthan most famous travel destination in India. This list of Rajasthan’s best places to visit will be helpful while planning a trip to Rajasthan. Rajasthan houses an amazing display of arts and architecture, courtesy of it being a princely state. The forts, palaces, sand dunes, camels and the multicolored turbans all add up to make Rajasthan an irresistible travel destination. The places mentioned in 10 popular places to visit in Rajasthan are top tourist attractions in Rajasthan, India. Rajasthan is famous for the majestic forts, intricately carved temples and decorated havelis, which were built by kings in previous ages. Jantar Mantar, Dilwara Temples, Mirpur Jain Temple, Chittorgarh Fort, Lake Palace Hotel, City Palaces, Jaisalmer Havelis are part of the architectural heritage of India. All the places listed here surely fall in top 10 popular places to visit in Rajasthan. But covering all places in short duration may not be possible. Say, You have 4-6 days of travel duration, in that case choose from must visit places of Rajasthan-Jaipur, Udaipur, Jodhpur, Ranthambhore, Jaisalmer. You should ask your tour operator to cover major attractions depending on your travel duration. The palaces of Jaipur, lakes of Udaipur, and desert forts of Jodhpur, Bikaner & Jaisalmer are among top tourist places to see in Rajasthan. Purpose of this blog is to provide information. If unintentionally we have used any copyright content/image, we request you to inform us about the same using Comment or Contact form. Mention link and details of the issue. We will take necessary action by deleting that content/image or giving full credit to your site for that subject. Also, If you have any issue with site layout/template, let us know. TourTipsTravelGuide © 2016. All Rights Reserved.